The mechanics of great subduction earthquakes are influenced by the frictional properties, structure, and composition of the plate-boundary fault. 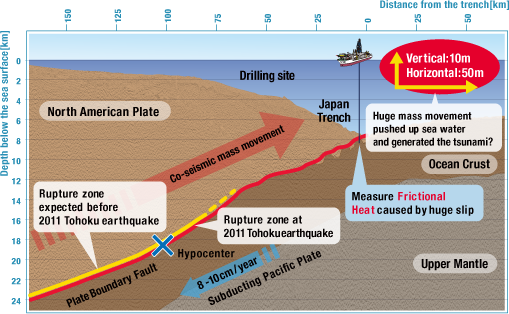 Logging-while-drilling and core-sample observations show a single major plate-boundary fault accommodated the large slip of the Tohoku-Oki earthquake rupture, as well as nearly all the cumulative interplate motion at the drill site. The localization of deformation onto a limited thickness (less than 5 meters) of pelagic clay is the defining characteristic of the shallow earthquake fault, suggesting that the pelagic clay may be a regionally important control on tsunamigenic earthquakes. Large coseismic slip was thought to be unlikely to occur on the shallow portions of plate-boundary thrusts, but the 11 March 2011 Tohoku-Oki earthquake [moment magnitude (Mw) 9.0] produced huge displacements of ~50 meters near the Japan Trench with a resultant devastating tsunami. To investigate the mechanisms of the very large fault movements, high-velocity (1.3 meters per second) friction experiments was conducted on samples retrieved from the plate-boundary thrust associated with the earthquake. The results show a small stress drop with very low peak and steady-state shear stress. The very low shear stress can be attributed to the abundance of weak clay (smectite) and thermal pressurization effects, which can facilitate fault slip. This behavior provides an explanation for the huge shallow slip that occurred during the earthquake. The frictional resistance on a fault during slip controls earthquake dynamics. Friction dissipates heat during an earthquake; therefore, the fault temperature after an earthquake provides insight into the level of friction. 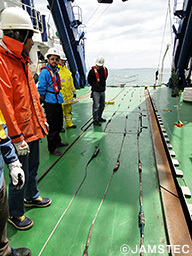 The Japan Trench Fast Drilling Project (Integrated Ocean Drilling Program Expedition 343 and 343T) installed a borehole temperature observatory 16 months after the March 2011 moment magnitude 9.0 Tohoku-Oki earthquake across the fault where slip was ~50 meters near the trench. After 9 months of operation, the complete sensor string was recovered. A 0.31°C temperature anomaly at the plate boundary fault corresponds to 27 megajoules per square meter of dissipated energy during the earthquake. The resulting apparent friction coefficient of 0.08 is considerably smaller than static values for most rocks. The Proceedings of the Integrated Ocean Drilling Program, Expedition 343/343T, Japan Trench Fast Drilling Project (JFAST), has been published online. Underwater image shows the top of installed temperature observatory in the borehole on deep seafloor. Image was taken by the KAIKO 7000-II on 26 April 2013. The retrieved temperature sensing loggers on deck of R/V Kairei. Picture was taken on 27 April 2013. The JAMSTEC research vessel Kairei has successfully retrieved the sensors from the deepest borehole observatory ever installed from the extreme ocean depths of nearly 7000 meters on 26th April, 2013. The R/V Kairei carried out the complex sequence of operations in the Japan Trench using the remotely operated vehicle KAIKO 7000-II to locate, detach and reel-in the array of 55 temperature sensing loggers from a borehole that straddles the plate boundary where the fault slipped ~50 m during the magnitude-9 2011 Tohoku-oki earthquake. The Scientific Drilling Vessel Chikyu installed the observatory in a dedicated borehole that penetrated 855 meters below the seafloor in a water depth of 6897.5 meters during the Japan Trench Fast Drilling Project (JFAST) for the Integrated Ocean Drilling Program (IODP) Expedition 343/343T; April-July 2012. The recovered sensors provide data that will be used to determine the frictional heat generated by fault slip during the Tohoku-oki earthquake. Scientists will infer the forces on the fault during the earthquake from these measurements of dissipated energy. The new data are critical to understanding the causes of the large, shallow displacements during earthquakes that can generate devastating tsunamis. The JFAST observatory provides the first temperature measurements at a subduction plate boundary fault immediately after an earthquake. Further research results are expected to follow careful analysis. The 11 March 2011 Tohoku-Oki earthquake (Mw9.0) produced the largest slip ever recorded in an earthquake, over 50 meters. Such huge fault movement on the shallow portion of the megathrust boundary came as a surprise to seismologists because this portion of the subduction zone was not thought to be accumulating stress prior to the earthquake. In a recently published study, scientists from the Integrated Ocean Drilling Program (IODP) shed light on the stress state on the fault that controls the very large slip. The unexpectedly large fault displacements resulted in the devastating tsunamis that caused tremendous damage and loss of lives along the coast of Japan. The study, published in 8 February 2013 issue of the journal Science, presents compelling evidence that large slips are the results of a complete stress drop during the earthquake. These new findings from IODP Japan Trench Fast Drilling Project (JFAST) research are relevant to better understanding earthquakes and tsunamis in many areas of the world. The data and core samples obtained during this expedition will be disclosed a year after the end of the expedition. Installation of the observatory assembly has the objective of directly observing the long-term changes in the frictional heating at the plate boundary fault in order to clarify the frictional properties of the fault that caused the megaquake and tsunami. It is anticipated this data will clarify the slipping mechanism of the plate boundary fault near the trench axis that caused the great tsunami. This is the world's first attempt to measure temperatures of a plate boundary fault soon after an ocean trench earthquake. The schedule is to recover the observatory assembly this autumn. The obtained data and samples (LWD and core) in this expedition, as well as long-term temperature (instruments to be installed in this summer) data will be analysed comprehensively to delineate the slip characteristics (physical and chemical properties that define the frictional properties of the fault) and deformation mechanisms at the toe of the plate boundary. These studies are fundamental investigations for understanding fault properties and mechanisms of a tsunamigenic faults near the trench axis. Such understanding is expected to contribute to mitigation of disasters caused by megaquakes and the associated tsunamis. The project performed LWD, logging while drilling, at Hole C0019B, where the total drill pipe length reached 7,740 m from the sea surface to the bottom of the borehole (a water depth of 6,889.5 m plus a subseafloor depth of 850.5 m) This marks the new record length, exceeding 7,049.5 m (a water depth of 7,034 m plus a subseafloor depth of 15.5 m) recorded by the Glomar Challenger at the Challenger Deep in the Mariana Trench in 1978.